This eye cream protects and stimulates the superficial layers of your skin, reliably combating dark circles under the eyes, helping to reduce the appearance of swelling. Pure silk particles, selected oils and refreshing moisture pamper the skin, making it unbelievably soft and visibly reducing the appearance of fine lines. 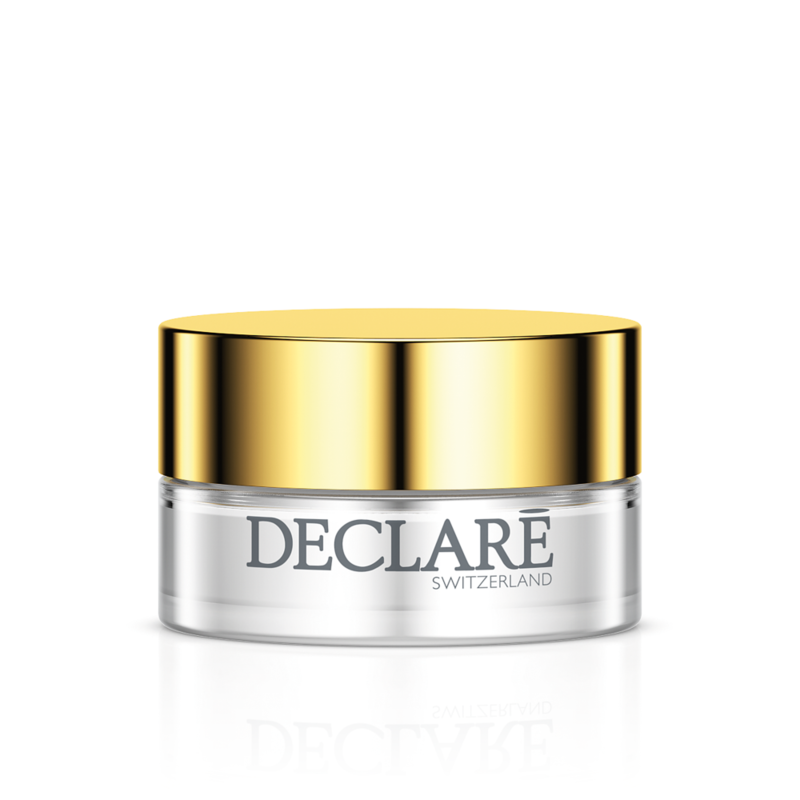 With the unique Declaré src-complex™ for smooth, fresh skin with new radiance. AQUA (EAU/WATER), BUTYLENE GLYCOL, ISOSTEARYL ISOSTEARATE, METHYL GLOCUSE SESQUISTEARATE, CETEARYL ALCOHOL, GLYCERYL STEARATE, HYDROGENATED COCO-GLYCERIDES, OCTYLDODECANOL, PROPYLHEPTYL CAPRYLATE, CAPRYLIC/CAPRIC TRIGLYCERIDE, GLYCERIN, SACCHARIDE ISOMERATE, BUTYROSPERMUM PARKII (SHEA BUTTER), MACADAMIA INTEGRIFOLIA (NUT) SEED OIL, MAGNOLIA OBOVATA BARK EXTRACT, HYDROLYZED LINSEED EXTRACT, MALUS DOMESTICA FRUIT CELL CULTURE EXTRACT, CENTELLA ASIATICA EXTRACT, CALENDULA OFFICINALIS FLOWER EXTRACT, RUSCUS ACULEATUS ROOT EXTRACT, ECTOIN, PANTHENOL, DIMETHICONE, SODIUM HYALURONATE, GERANYLGERANYLISOPROPANOL, SERICA (SILK) POWDER, HYDROLYZED YEAST PROTEIN, HYDROLYZED LUPINE PROTEIN, TOCOPHERYL ACETATE, TOCOPHEROL, LECITHIN, STEARETH-21, ASCORBYL PALMITATE, XANTHAN GUM, ESCIN, TETRASODIUM GLUTAMATE DIACETATE, SODIUM CITRATE, SODIUM HYDROXIDE, PHENOXYETHANOL, SODIUM BENZOATE, PARFUM (FRAGRANCE), CITRIC ACID. Matin et soir, après le démaquillage, appliquer en tapotant sur le contour des yeux.